Iraq vs Illegal Immigration? Immigration wins! Posted on January 31, 2009 June 30, 2018 by GlennPosted in podcast, politicsTagged podcast, politics. Previous Previous post: Food miles or political mileage? Wow — lots to comment on and no time to do it. I thought your construction at the beginning was excellent. People voted for Obama because he was a black man. The racist underpinnings of his election were explicit throughout. Black rappers pumped up their fans through racist messages about putting Cheney in a wheelchair and getting a black man in charge. More than one Obama supporter claimed after the election, to their regret, that they didn’t have to listen to white cops anymore. Affirmative action apologists cried tears of joy. But the total and complete absence of any discussions of his substantive qualifications to be president reminded me alternately of a Twilight Zone rerun or the Simpsons episode ending in “Don’t blame me, I voted for Kodos.” As I mentioned in a previous comment, Obama presented himself as a shell without substance, and the voters projected on him their personal desires. That leads to the second point. I think you were dead wrong when you said that Jon Stewart’s quip — “in Obama’s case we know he doesn’t mean it” — was not serious or was incorrect. I started at Harvard Law the fall after Obama graduated. I knew many of the professors he claimed to have gravitated to and associated with. I watched his campaign rhetoric from the very beginning. I wish I could say otherwise, but based on these impressions and others, I truly believe that Obama hates the concept of America. Although the parallel clips you ran on the equivalence of Obama’s and Bush’s (and Hillary’s) rhetoric suggest that Obama is not substantively different, the fact is that he had to say those things in order to retain the vote of the blue collar base that democrats depend upon. As an analogous situation, note Obama’s responses on the question of the Second Amendment, which acknowledges a natural right of all free human beings to keep and bear arms for their self defense and, under the Lockean principles active at the founding of the United States, to preserve the right of revolution. Like many democrats before him, Obama has a record of anti-gun legislation and position statements. Yet during the campaign, blue collar union workers who were threatening to bolt over perceptions that Obama will reenact strict gun controls, were informed by their United Mine Workers of America union bosses that “Obama will never come and take your guns.” Nonetheless, there is little doubt that, once big ticket issues like destroying the American economy are out of the way, Obama will at the very least enable the democrat congress to do exactly that. The point is that Obama must say certain things to at least preserve for a large part of his base the illusion that he’s a centrist. But his actions clearly indicate that he is radically at odds with traditional conceptions of American liberty and the Rule of Law. With that possibly hyperbolic exception to Ep. 24, it was a great episode and a nicely balanced break from theology. Thanks! Dan, I really get the feeling that you believe that Obama hates America, knows that he hates America, and plans on hating it some more. Whether he hates America, he certainly doesn’t love it. Nor does he much care for Americans. Ilion, there are at least two things that it might mean to “love America.” The first sense is that someone actually loves what America is, the way it was founded, what it was meant to be. The other sense is that someone loves America in that he cares about it so much that he wants to make it into something different because he thinks it would be better off that way. I’m assuming you mean that Obama fits into the second group. I think his political ideals are dead wrong and that his policies are immoral and unwise, but it’s not charitable to say that he doesn’t love America. He wants what he thinks is best for America, but he just happens to be fundamentally wrong about what that is. I need to clarify and add nuance. First, when I say I believe Obama hates America, the “America” in that statement is a set of ideals based largely in Judeo-Christian ethics and the ideals of classical liberalism. Those are goals, and unfortunately more honored in the breach than in practice. It is entirely possible that Obama loves this country as a geographic and social entity. 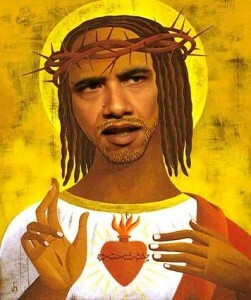 Second, I believe Obama hates the Judeo-Christian and classically liberal ideals because many black Americans (among others) see them as a hypocritical mockery of justice designed to justify and perpetuate a facially neutral but systematically unjust system. (Cf. much of the Critical Legal Studies and Critical Race Theory scholarship of the last 30 years.) I don’t agree with him, but I understand how he may have come to that position. With all that said, I still cannot find any evidence outside of empty campaign rhetoric that Obama thinks of America in terms of a country and an ideal, rather than a big pie that needs to be sliced up and distributed to his constituents. Finally, I acknowledge that I might also be as guilty of projecting my personal preferences on Obama as others. Hence, my admission in my first post that I may be encroaching upon hyperbole. One last clarification to my clarification — I associate Obama with the Critical Legal Studies jurisprudence and philosophy because of his associations at Harvard and many of his unguarded campaign statements, not because he is black. I am more concened with truth than with niceness (which, in this case, is what I take your use of ‘charity’ to primarily mean). I did not say that he *hates* America, for I do not know that … though, I would not be shocked to learn that it is true. I said he does not love America. Try “loving” your wife that way, or try loving a woman who “loves” you that way. If one does not love America, then one does not love America. Mr Obama claims to be an American, but he does not love America, nor respect it and its symbols, nor does he actually respect Americans — we’re too déclassé. It’s one thing to criticise that which you love when it falls short of “what it is supposed to be” … it’s quite another thing to demand that that which you “love” be other than it is. Ilion, by charity I am not referring to niceness, but fairness. I never said, of course, that you believe Obama hates America. I discussed two different senses of how a person could love America, and I think it’s clear that in at least one of those senses (the second sense), Obama loves America and it would be uncharitable to say otherwise because it’s not fair and it’s unlikely to be true. You pose a challenge about “loving” my wife the second way. But why would I? I love my wife the first way. However, there is nothing strange about loving people the second way. Therapists do it. Doctors do it. Personal trainers do it, and so forth. They express care and concern for people (OK OK, they do get paid to do it) to the extent that they try to help them improve. The reality is, although I do love my wife in the first sense, I do love her in the second sense as well to some extent. Since I care about her very much, I am always supportive of any attempts on her part to improve herself, and if I think that something is good for her, I may do it. Obama is doing what he (incorrectly) thinks is good for America. The second way is not love, which is *why* posed the (double) challenge. That it is extremely common for people to “love” others in that manner doesn’t make it love. I am fair; I am not nice. Illion, you’re not being fair. It’s simply unfair to stipulate that you are ruling out one kind of love. Love it or hate it, wanting to improve somebody really can be an expression of love. I do not believe that Obama is articulate. In fact, when he does not have a teleprompter, he is stuttering and humming and ah’ing through words and has trouble finding what he wants to say. He has been shielded from truly off script interviews and press conferences. I was Googling something else (not even related to this blog) and just happened to run across this old exchange between Mr Peoples and myself; which, if I recall correctly, was my first direct experience of his madding style. While I initially believed only that Mr Obama does not love America, nor care much for Americans, I have since decided that he actively hates America and despises Americans. That’s Dr Evil. I didn’t spend six years in Evil Medical School to be called “mister,” thank you very much. But refusing to call *anyone* ‘Doctor’ is part of my evil plan.